EA: Crysis 2 Will Be a "Halo Killer"
Apparently, nobody at Electronic Arts got the memo that Halo isn't the console shooter to beat anymore, since it's calling Crysis 2 a "Halo killer." "...we were trying to craft a Halo-killer, you know a product that would squarely go after what Bungie built with our partners at Crytek. 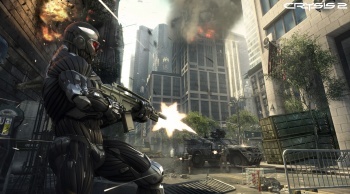 So the Crysis 2 product is spectacular, very high-end, and is going to be a multi-year franchise," said Gibeau. In fact, Gibeau is rather proud of EA's portfolio of FPS developers, not the least of which is the new team surrounding Jason West and Vince Zampella at Respawn. "when you look at Crytek, DICE, Epic, the LA team building MoH, and then Respawn, you know we got a pretty damn killer team," he said. It's funny that he mentions Respawn, actually, because West and Zampella were of course responsible for the Call of Duty series - the series that actually dethroned Halo from its perch. So either Gibeau is aiming low, or he hasn't yet gotten the intel that Halo is no longer the top dog in town to beat. Hell, couldn't you argue that with the upcoming Reach, Bungie itself is "killing" Halo? It's the supposed series grand finale, after all. I wouldn't be surprised if Crysis 2 did in fact outsell Reach, as it will be on the PS3 and PC instead of just the Xbox 360. More than anything, though, this speaks to the power of the Halo brand - even after it's been kicked from the king of the hill as the best-selling console FPS, it's still the game to beat. Even if it makes you look a bit backward to say so.